On March 12, 1864, President Abraham Lincoln appointed Ulysses S. Grant as General-in-Chief of the Armies of the United States. Upon his arrival in Washington, Grant drafted a plan to get the various Union armies in the field to act in concert and strike the Confederacy from several directions: Grant would travel with Major General George Meade’s Army of the Potomac in pursuit of General Robert E. Lee’s Army of Northern Virginia in the Richmond area; Major General William T. Sherman would march three Federal armies south from Chattanooga to capture Atlanta; and Major General Franz Sigel would invade Western Virginia’s Shenandoah Valley to cut off supplies to Lee’s army and to prevent any Confederate attempts to attack Meade’s flank. The Union Army of the Potomac relentlessly engaged the Confederate Army of Northern Virginia throughout the spring of 1864. By June Grant forced Lee to retreat to the Richmond-Petersburg area. Thereafter, both armies entrenched and a stalemate ensued for the next ten months. During that period, Grant probed Lee’s defenses, but to no avail. Despite being well entrenched, the Confederate situation grew progressively worse as their supplies dwindled. By the spring of 1865, Lee knew that when the weather allowed, his army must escape the Union stranglehold or be starved into submission. On March 25, 1865 Lee made one final attempt to break the Siege of Petersburg by ordering forces commanded by Major General John B. Gordon to attack Fort Stedman, a Union fortification in the siege lines surrounding Petersburg. Gordon’s pre-dawn attack was successful initially, but blistering Union counterattacks forced the Rebels back inside their lines. Grant’s spring offensive, the Appomattox Campaign, began in late March 1865 when Sherman’s troops south of Petersburg moved west with orders to threaten or capture Boydton Plank Road and the South Side Railroad, which connected to Petersburg from the southwest. Grant intended cut off supplies coming into Petersburg and to prevent Lee from using the two arteries as avenues of escape from the city. On March 29, Major General G.K. Warren’s 5th Corps defeated several Confederate brigades commanded by Major General Bushrod Johnson at the Battle of Lewis’s Farm. Two days later, the action resumed at the Battles of White Oak Road and Dinwiddie Court House as Lee shored up his right wing to halt the federal flanking maneuver. On April 1 Sheridan and Warren continued their offensive, with a major victory over Major General George Pickett’s forces at the Battle of Five Forks. The loss of that strategic crossroad further threatened Lee’s already limited supply lines. Encouraged by the Federal victory at Five Forks, Grant ordered a general assault on the Confederate entrenchments around Petersburg on April 2. Federal troops breached the Confederate defenses during the Battle of Petersburg III and forced the Rebels to withdraw to the city’s inner defenses. By 10 a.m. Lee realized that the day was lost and he advised President Jefferson Davis to prepare to leave the Confederate capital at Richmond. Lee spent the afternoon preparing his withdrawal from Petersburg. Lee’s plan was to march his beleaguered army west to Amelia Court House where he expected to find much-needed provisions. From there he intended to move south and join forces with Major General Joseph E. Johnston’s Army of North Carolina. As the Confederates moved west Sheridan’s cavalry began hounding them almost immediately. Three minor engagements took place during the next three days at Sutherland’s Station, Namozine Church, and Amelia Springs. On April 6, Lee was marching the Army of Northern Virginia west toward Farmville where supplies awaited. Lee’s 1st and 3rd Corps, commanded by Major General James Longstreet, led the march. Major General Richard Anderson, commanding the army’s 4th Corps, followed Longstreet. Two more divisions, led by Major General Custis Lee and Major General Joseph B. Kershaw, under the command of Lieutenant General Richard S. Ewell, trailed Anderson. The Confederate 2nd Corps, consisting of three cavalry divisions commanded by Major General John B. Gordon, served as Lee’s rearguard. The Federals scored a decisive victory at the Battle of Sailor’s Creek on April 6, capturing about 7,000 Confederate soldiers, including nine generals. Lee ordered another in a series of night marches to move what remained of his army west. The Rebels crossed the Appomattox River that night, but failed in their attempts to destroy the wagon bridge at High Bridge on the morning of April 7, enabling the Federals to continue their pursuit. On April 8, Major General George Custer’s cavalry seized a Rebel supply train and 25 guns at Appomattox Station, denying the Rebel army much needed provisions. Later in the day, Custer also overran Lee’s lead artillery unit and secured the high ground west of Appomattox Court House, directly in Lee’s line of retreat. On April 9, Lee made a last desperate attempt to escape Grant’s clutches. He ordered Major General John B. Gordon’s 2nd Corps of the Army of Northern Virginia to attack Major General Philip Sheridan’s Cavalry early in the morning. Lee hoped to break through the Federal force to his front and continue his march west. The Union cavalry was stationed along the ridge that Custer had secured the day before. Gordon’s troops successfully penetrated the Federal cavalry and seized the ridge. To his dismay, however, Gordon discovered that on the other side of the ridge he faced the entire Union 5th and 24th Â army corps formed for battle. Gordon had no alternative other than to withdraw. Meanwhile, to the north of Appomattox Court House, the Federal 2nd Corps was moving against Major General James Longstreet’s 1st Corps. 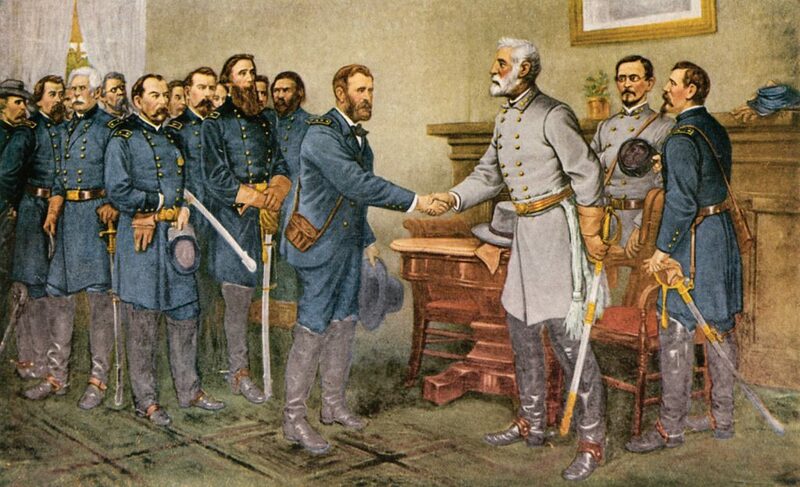 Realizing that his army was trapped, Lee contacted Lieutenant General Ulysses S. Grant asking for terms of surrender. After several hours of correspondence as cease-fire was agreed upon and the two generals met at the home of Wilmer McClean’s where Lee agreed to surrender the Army of Northern Virginia. Estimated casualties at the Battle of Appomattox Court House totaled about 700, but that number does not take into account the 27,805 soldiers that Lee surrendered to Grant. The Battle of Appomattox Court House was the last battlefield engagement of the Army of Northern Virginia and it was also the last battle of the American Civil War fought in Virginia.